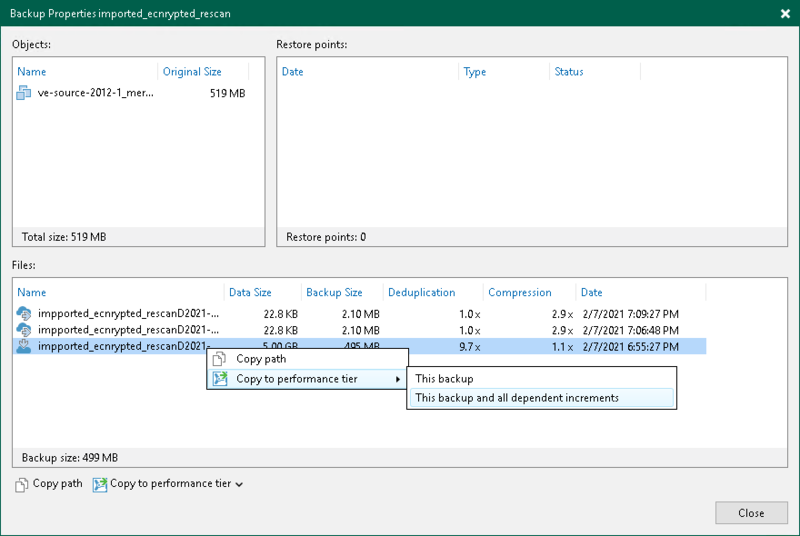 The Copy to performance tier option allows you to download offloaded data from object storage repositories back to the source extents. For more information about how Veeam downloads the backup data, see SOBR Download Job. Copying offloaded data may be useful in certain situations. For example, you may want to transfer this data to any other storage device or perform certain operations with the VMs in a backup file and then offload it back to the cloud once you have done working with it. This backup and all dependent increments — to copy the selected backup along with its associated increments. This backup — to copy a full backup only. To remove copied blocks from the extents, use the Move to capacity tier option, as described in Moving to Capacity Tier.